"Heian Bijin" to describe girls' faces. Actually, this words are kind of confusing. 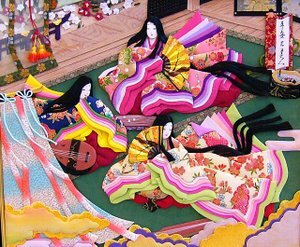 "Heian" means "the Heian era", "Bijin" means beautiful women, in short, it is mentioning "beautiful women like noblewomen in the Heian era." Though the word "Bijin" has definitely a good meaning, if you put the words "Heian" in the front of it, it varies totally. Heian bijin's traits are stated below. Actually, the figure you can imagine from these is alien from what beauties should be nowadays. As a matter of fact, in the Heian era, women who have these traits were really considered "beautiful women" and if you see this picture, you would think these women must have been beautiful and elegant. However, the truth is different. Rather, they must have been like monsters! In this era, noblewomen weren't supposed to go out and the food was undernourished, so they were unhealthy, that's why their faces were swollen. Then they completely removed their eyebrows, wrote them on upper forehead with eyebrow-paints, and these written eyebrows were supposed to be apart from each other as much as they could. Besides, they put a lot of powder on their faces to make them look pasty white, fragile for the sake of guys visiting them at their houses under cover of night. Moreover, they dyed their teeth black, and the length of their hair was approximately 7 m, because they didn't cut their hair ever since they were born.